8 comments in reply to "Ch-ch-ch-changes! (Both personal and fiscal impulse)"
So glad to see you posting so soon. So worried you might be back at work too soon. On spending levels… When you can, might you expand on the types of spending that have the most impact? Thanks for you concern! I’m just putting in a few hours for now with rest and walks in between, so don’t worry–I understand the need not to rush the healing process. I don’t know about granular elasticities (bang for buck)–like spending on food stamps is more stimulative than spending on roads. Zandi makes such estimates, as in here https://www.economy.com/mark-zandi/documents/Stimulus-Impact-2008.pdf I do believe that tax cuts for the wealthy are pretty low on that list as they’re not income constrained, so they’re less likely to spend the marginal tax break dollar. I’d say that right now, the bigger force is the Fed. 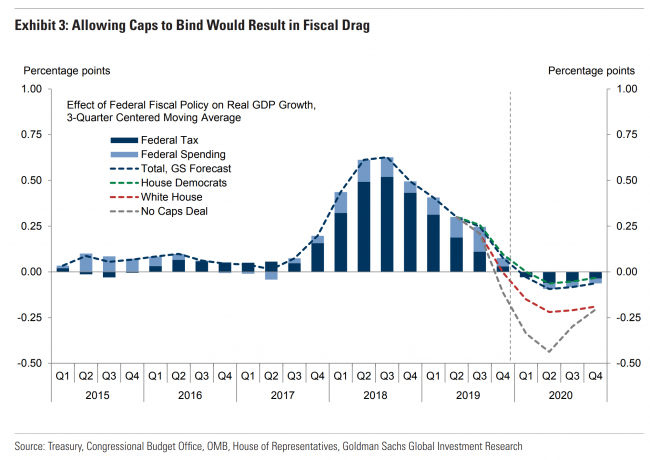 If they’re not raising rates–if they’re current pause holds–then that will boost the multiplier of any fiscal impulse. Nice to have you back, Jared. Onward! Why is the change of fiscal impulse more important than the level, or is that a function of how fiscal impulse is defined, Jared? Welcome back. It’s definitional, but that’s because it’s the change that affects growth. Think of G in the GDP identity (C+I+G, etc.). If the level of G is unchanged (no fiscal impulse) it doesn’t have any impact on the change in GDP. Great to see you posting again! And writing about issues I don’t quite understand — that’s a good sign!! (For *you* that is!! ).